Insurance company adjusters will tell you to wait to get a workers comp lawyer after a serious work injury. I just spoke to a nice guy with a legitimate work injury in D.C. In fact he has a serious back injury. But he waited too long for me to be able to help him - and waiting will end up costing him a lot - in terms of medical treatment, money, time and aggravation. He thought by doing everything the insurance company told him to do that he was doing the right thing for workers compensation. Instead, the insurance company controlled his medical care, telling him to treat with some "worker's clinic" they probably fund and control and see insurance company doctors with no connection to him as a patient (because they get so many referrals from insurance companies). Turns out his injury was more serious than they thought. Don't let this happen to you. Get all of the info you can. 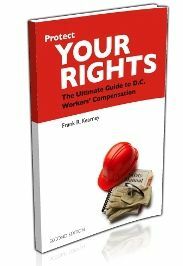 Read Protect Your Rights: The Ultimate Guide to D.C. Workers' Compensation, The Union Worker's Guide, or one of our short, easy to read reports like 5 Mistakes that Will Absolutely Kill Your Worker's Compensation Case. Talk to us early in the process - so we can stop you from making mistakes that may cost you hundreds of dollars each week. Don't let this happen to you - you can find out the basics in 10 minutes. And we reserve times every week to talk to people with questions - no obligation, cost, etc. So call to schedule a short phone call so we can answer your questions and get you the information you need. I was severly hurt on 6/20/13 brought to the hospital by ambulance from work. There was 30 people who saw the accident caused by my companys trainer. My leg was litterly twissed all the way around. Sent home from Er with instuctions to go see the ortho surgen in the morning. Ortho had no openings so i went to my doctor. He got me in with ortho on monday.Found a blood clot and that's all I've recived treatment for since. They cancelled my specialist doctors appointment and my MRI. Stuck in bed ( cause my leg has to be Elevated at all times or my foot sweels and turnes purple) all day in pain and still have no idea what is wrong with me. Can they denie me medical treatment when the injury is so servere. My case has been under investigation for 4 weeks they said there waiting on medical records. But talked to my doctors and they haven't requested them. What do I do! !